so when the sofa began to be dismantled, and the path to the front door cleared, she insisted on being in the same room.....refused to stay on Her Cushion upstairs...and sat under the table doing the Heavy Breathing, We are Not Amused act. The sofa and chairs went. I cleaned the room and put it tidy. We hunted everywhere we could see, shone a torch where we couldn't. No cat. Four hours later she wandered back into the dining room and stopped. Disaster!! There was room to move and the room was different!!! I have Freegled a huge sofa and chairs today-relief!! With the help of daughter and her husband inroads have been made on the recycling and junk and stuff!! It is beginning to feel like a home at last. Unless it is sorted properly by June, they wont be visiting with the expected twins- so we must keep up the good work!! The kiln flue is connected, now needs a final clean from inside the kiln. I used an old unused kiln shelf for the damper. I can fire now so long as the workshop door is open!! I'm sure that a hole in the wall for the gas pipe will not be a huge problem, thankfully. The Oily One has been welding, assisting our friend Richard with constructing a pot rack. This is made from half an old kiln frame (one side) using all four castors from the kiln. Hey Presto, one movable pot rack with room for twelve wareboards with eight inch gaps. 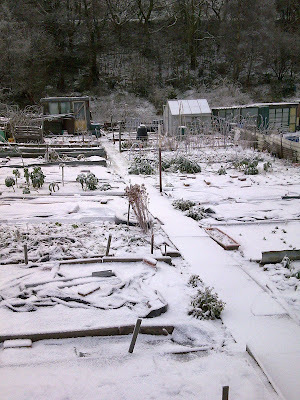 Although cold this morning, this afternoon I did an hour's hoeing and tidying on the allotments. It is still too wet to dig, and I can only hoe because I never walk on the earth, just stay on the paths. On the mountain above the village the ground is still like stone. Now it is getting decidedly chilly- frost again tonight? Just need to get the Oily One back from doing car stuff before it rains!! Then we will have an attached kiln chimney. The workshop has that dead cold feeling, it needs a bisque firing to make it ok to work in again!! I have four grown children, 75% of whom are employed, 50% have partners. I have a house of my own, Thanks to The Carpenter I still have it, now shared with him. I have my Mountain Man. I love him dearly and never take him for granted. I nearly have a working kiln, it is just about warm enough to throw pots again, and the Salt Firings wont be long in coming round again. I have my allotments and have just lifted parsnips and leeks and got kohl rabi out of the store shed. I have my creaks and aches, but my health could be so much worse. Why can't life be a little easier sometimes?!! The kiln is SO near to being useable, but The Oily One wont help, and The Carpenter is busy signwriting in distant places. My website is changing server, but I can't seem to access the account that has been set up for me. The computer is a tool I need to use, but I do not find it as easy as it is supposed to be!! The Jobcentre told me to go to a specific meeting, which I did...now I have a nasty letter telling me off for not going, when I was ticked off as present on two occasions. Of course I get the letter on Friday evening when I then have to worry all weekend and waste more time and money sorting matters!! He has four cars, none of which now work. He has been spending money on fuel to travel a 120 mile round trip to help a friend with a car. I have had enough, but I do not want to be nasty. If I kick him out he has nowhere to go, and would end up on the streets . He needs a large kick up the posterior, but I don't know how to do that in a constructive manner that would get him motivated. We had a good day out yesterday, despite starting with driving through clouds over the Llangynidr Mountain. Pony Paperwork! Up to Aberystwyth to the Welsh Cob and Mountain Pony Society. I'm glad my passport isn't as detailed as an equine passport!! A visit to daughter was made too , it was good to see her and the growing bump (twins) and Indeg the cat (briefly!!). The rivers were all still full with meltwater, but it was interesting to see the Wye below Llanfair ym Muallt (Builth) at a little after 11am then again after 4pm. In five hours it had gone from really full but not quite overflowing to fairly full and most of the rapids showing turbulence and fast flowing water. It was good to see and feel the sun and a gentle breeze- our first hatless day for months, between rain and snow!! It would have been a good day spent together whatever the weather. The snow has returned- but above 6oo feet. Only cold and damp down here. All the Oily One's washing is clean! Now we must attack his hoarding tendencies!! Today I dealt with half a washing mountain and it was such a relief to have most of it dried on the line! The bread dough was started after lunch, and this time I tried making a 'poolish'- like a batter with tepid water, yeast and half the flour in the middle of the flour in the bread mixing bowl. That was left for four hours while we went to check the ponies. One family group we found together where I had seen them yesterday at the northern end of the Common. The rest were in twos and threes near the southern end, and we had a good walk to find them. We left Twmbarlwm as it began to rain and the light faded. By the time we returned to our village it was raining steadily, but up Mountain Man's lane I still had to follow the clear tracks in the ice that he had cleared with chains on the Landrover. Now the bread is baking, and hopefully this looks an easier method with more leeway for when things that need doing turn up unexpectedly!! Washing out on the line half an hour since, next wash nearly done and a small mountain in the queue for the wash.
Why does "housework" get priority over what I want and need to do? Is it that I need that properly sorted so that my head can then deal with other stuff? At least I can enjoy a clear break in the winter weather. The snow has been washed away from the valley bottom, although there are still traces on the slopes, and it will still be lying in its drifts on the mountain tops. Going up the lane from Upper Cwmbran up to the Mountain Air was like driving up a small river. It will be even worse by now after three more hours of heavy rain and snow melting. At least I saw thirteen of the ponies, one of the usual family groups with the dun mares as leaders. All rather wet but not miserable! It wasn't my sort of thing, but still it is interesting to see how other people interpret their ideas and challenges. Good excuse for lunch out too!! The workshop has that solid chill feeling that hits you as you step over the threshold-but at least it is a little warmer now!! I must get in there tomorrow and do some finishing and making before the weather freezes again! On both Radio Cymru and Radio Wales, people have been recounting their experiences of previous hard winters. Every one was remembered for being a Long Haul. Valuable memories not only to be caught and recorded, but also to be learned from....being "old fashioned" has its merits. Having a storecupboard, an alternative source of heating and cooking , a Flashlamp by the door for walking at night or powercuts. Pure as the Driven Slush!!! Indeed! It is those with a clean roof and a private snowdrift blocking the doorway!! Last night the washing line was a soft thick white rope, and each and every roof had a topping of snow like the crust on a well risen loaf. The sky was an eerie soft orange from the reflected street lights, showing how much light pollutes the sky instead of being reflected down to use where it is allegedly needed. Some councils are beginning to turm street lights off between 11pm and 5am- high time I say!! In other countries street lighting is limited to junctions- after all if you are driving, you have headlights. It is being done as an economy drive, but now more people can see the stars, and birds live longer by not being forced to be on the go by artificial lighting. All of eight inches fell yesterday, and we have been having showers of large soft flakes of snow today. As it is falling, it is also thawing, but there is freezing rain on its way here from West Wales on the tail of the snow, apparently. Today the Carpenter - I should change his name to Signwriter perhaps? -was back doing signwriting for the local firm again. He needs contracts elsewhere, but in this case we are grateful for small mercies and glad he has something again. I must brave my chilly workshop soon, there are pots to turn and handle, and more to throw. In the meantime I am ridding myself of clutter, hoping that this week's council refuse and recycling collections go ahead, and knitting for Daughter's expected twins. You are borrowing my car. There are weather warnings, start back about 4pm. 3.30, blizzards in West Wales. I tell them this, tell them the view from the traffic cameras. Of course up in Tewkesbury they don't believe me. They start for home just before 6pm. The remaining snow is frozen solid. Buses are bypassing the village main street (only two minutes walk) which is a blessing in a way- much safer!! I am busy knitting as my daughter is expecting twins in the summer, and my workshop is frozen. We have a foot of snow here, and I had a night of blissful sleep. The first traffic came at 5am...a quad bike!! Nothing much until about 8am, and still not a lot now, very sensible!! The Carpenter is taking a break from metal bashing (making a patch to mend the damage that metal moth has made in his car) to make a sled! Pictures? No, I am staying inside and warm!! It will look like the photos I took last February. The snow on the mountain is a foot deep as well- because it has been blown into six foot drifts! Slow progress, but heading in the right direction- The Carpenter is turning his skills to metal, and has begun to fit the flue together. and breaks to warm up as the weather is COLD!! Now I know why there is always "Potteries Fortnight" at this time of year!! On the mountain, the chickens' water supply pipes are freezing INSIDE the barns. The ponies are out wandering, they are well hardy! The foals are still stabled after being chipped. It is making work, having them in, but at least it is indoor work when the snow is thick on the ground and frozen too. Twelve o'clock came and I thought- shall I phone Mountain Man? Shall I phone her....no-she'll be sleeping....!! !